No-mess eating is the first thing that comes to mind when I heard about this product. There are times that I'd rather just spoon feed my toddler each time because it actually takes less work than cleaning up after him. But thanks to products like Little Green Pouch this mama can take a break from cleaning and feeding. 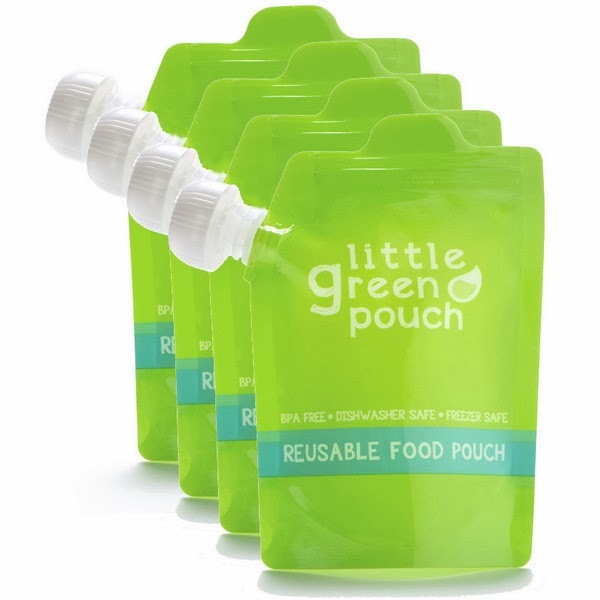 Little Green Pouches are reusable food pouch for babies and toddler. I usually fill mine with applesauce or yogurt. And they are so convenient especially when we go out. These squeeze pouches are easy to fill and and seal securely by means of a handy press zipper. My son loves his purees cold so its a big plus that its freezer safe. Cleans easily upside down in the top rack of the dishwasher. I've used it a few times already and I'm very impress with how durable they are. My little guy just loves eating from it. And oh did I mention they look so cute too. The bright green color makes makes my toddler excited about it. I'm really excite about this product and looking forward to using this for the new baby. Thank you so much for reading my review. If you want to know more about the product or want to purchase them can get them here. Or you can enter my giveaway for a chance to win a 4-pack package. Doing his happy dance while I hand him the Little Green Pouch! He really enjoys eating from it! Disclosure: I was given a free product to facilitate this review. However, all opinion are my own. I truly love this product. Please show your love by clicking on the picture below. This will cast a vote for my blog. Thank you so much. I would love these for my daughter! I would either put yogurt in the pouch or I would put a smoothie in the pouch! I was literally just saying I wish I could reuse the food pouches! I would put everything in them! Very nice review! Your son is adorable. Thank you for your sweet comment. Let me know if you want to follow each other to stay in touch. Have a great day. I would put applesauce in it! That is such a cute idea! So helpful! My nieces would love these!! I would puree everything and fill the pouches with sweet potatoes, squash, spinach, apple sauce, greek yougurt. The choices are endless, my almost 10 year old likes eating from the pouches just as much as my 5 year old. They are great I would love to have some reusable ones. The ones that I buy at the store seem like so much of a waste and these hold so much more which is also a big plus! I would fill the pouches with apple sauce, pureed peaches and anything else my little guy will eat. Very cool! I definitely would have used these when my kids were toddlers. We drive 5,000km a year (each way) with two four-year olds and these pouches sure would come in handy. Is the giveaway open to Canadians? Hi Sarah, thanks for stopping by your blog i visit yours all the time :) yes this giveaway is open to US and Canada! Thanks for your comment. Have a great weekend. Looks like fun to drink from that! I'd use it! I would put applesauce in it. I'd use this for pureed pears. I would sneak vegetables in with my son's applesauce and bananas. This awesome products were not available when my son was little so we miss out. Fantastic review Lala and your son is adorable.